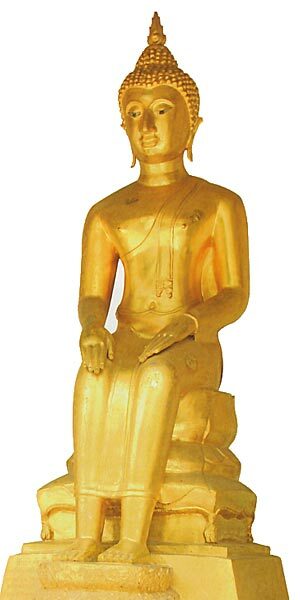 The Buddha sits in the so-called European or Western mode. In this variant both hands rest on the knees. In another variant the right hand palm is open at chest level. When the Buddha visited his father for the first time since his enlightenment, he crossed a river to reach his destination. After descending from Tavatisma heaven, the Buddha stopped his relatives from fighting over water rights between their properties. When entering his father's palace, the Sakya elders did not pay their respect. The Buddha displayed his special powers to them. Among other miracles, he initiated a rainstorm that wet those who did not respect him and left dry those who did respect him.